[prMac.com] San Dimas, California - MCE Technologies (MCE) announced today that it has begun shipping the MCE Complement: the world's first portable, all-in-one, USB 3.0 device consisting of a 2 TB Hard Drive, a Blu-ray, DVD, CD Reader/Recorder, a USB 3.0 Hub, and SD Card Reader. The MCE Complement's 2 TB hard drive is designed for use as a standard storage device and it is compatible with Time Machine. The unit includes Mac Blu-ray Player software for the playback of commercial Blu-ray titles directly on the Mac and it can record data and high definition video to 25GB, 50GB, 100GB, and 128GB Blu-ray recordable discs. In addition to recording and playing high capacity Blu-ray media, the drive is also a full-fledged SuperDrive and reads and writes all CD and DVD formats. The Complement also boasts an integrated USB 3.0 hub as well as an SD Card Reader. The MCE Complement is portable at 5.5 x 6 x 1.25 inches, weighs in at 19 ounces and includes a carrying case. It retails for $299.00 and is available immediately. "Apple's recent rapid desertion of optical media support and adoption of lower-capacity flash storage as standard configuration in their latest Mac lineups has created an opportunity for us to address these two issues simultaneously with one device that takes up little desktop space and uses only one USB 3.0 port for both power and data," stated Arnold Ramirez, president of MCE. "The Complement does exactly what it's name implies: It "complements" the user's Mac by providing full optical media support as well as providing a substantial 2 TB capacity drive for storage and backup." The MCE Complement's 2 TB hard drive is located inside an easy-to-access drive bay on the unit which is designed for use with standard off the shelf 2.5" SATA hard drives or SSDs and makes it easy to extend the storage capacity of the unit. 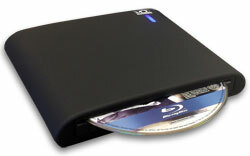 The Complement's optical drive capabilities allow it to record data and video to high capacity 25GB single-layer and 50GB dual-layer write-once Blu-ray BD-R media at 6X (27MB/sec), to 100GB triple-layer and 128GB quad-layer write-once Blu-ray BD-R XL media at 4X (18MB/sec), and to 25GB, 50GB, and 100GB rewritable BD-RE discs at up to 2X (9MB/sec). The drive is compatible with Apple's DVD Player application for the playback of DVD movies as well as with Finder Burning for burning Blu-ray Discs, DVDs and CDs at the Finder level. Blu-ray authoring of high definition video can be accomplished through the use of Roxio Toast 11 Titanium with HD/BD Plugin, Final Cut Pro X, or Adobe Premier. The drive is bootable and is fully compatible with all DVD and CD recordable media on the market today. The Complement also includes a USB 3.0 hub that provides two conveniently located USB 3.0 ports and one USB 2.0 data/charging port. An integrated SD Card reader reads SD, SDHC, and MMC media. The MCE Complement retails for $299.00 (USD) and includes a USB 3.0 Cable, User's Guide, Mac Blu-ray Player Software, MCE Complement Utility Software, and a carrying case. More information may be found at MCE Technologies online. MCE Technologies is a leader in the development of innovative storage peripherals and accessories for the Apple Macintosh platform and markets a wide range of Macintosh related products and solutions to distributors, dealers and end users. MCE is based in San Dimas, California and can be reached by telephone at (800) 5000-MAC (800-500-0622) in the U.S. or at (909) 599-3105 internationally. More information about products by MCE Technologies can be found on the the MCE Technologies website. Copyright (C) 2014 MCE Technologies. All Rights Reserved. Apple, the Apple logo, Mac OS X, and Macintosh are registered trademarks of Apple Inc. in the U.S. and/or other countries.